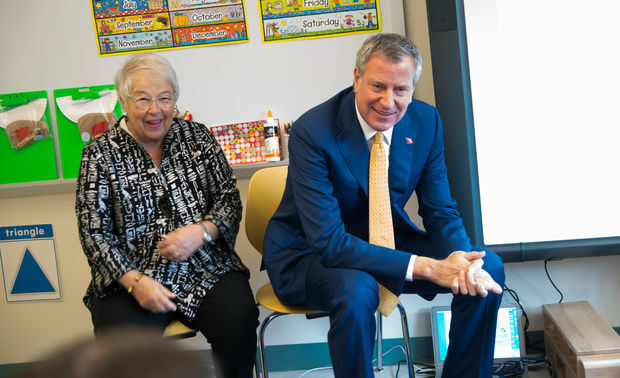 Mayor Bill de Blasio and Chancellor Carmen Farina inside a "mommy and me" class inside P.S. 316 in Ozone Park. NEW YORK CITY — The city's 3-K program will expand to two more school districts next year on its way to growing citywide — an ambitious plan the mayor said was more difficult than the pre-K program. The program, which launched this year at schools in District 7 in the Bronx and District 23 in Brownsville, will add six more districts by 2021 before expanding to every district in the city. By the 2018-2019 school year, 3-K will be available at schools in District 4 in East Harlem; and District 27, which covers the Rockaway peninsula, Broad Channel, Howard Beach and Ozone Park in Queens. The districts will have a two-year expansion plan, with classes launching in some schools the first year. It will be offered in all schools there by the second year, according to the Department of Education. "Pre-K has worked, 3-K is the next wave," Mayor Bill de Blasio said at the expansion announcement inside the Queens Explorers Elementary School in Ozone Park, which is in District 27 and will start 3-K classes next year. Their program for 3-year-old students will help the city reach "kids at the point that will have the biggest impact," the mayor said. The new districts were selected due to educational and financial need, but also because they had available space to open classes, de Blasio added. In the fall of 2019, 3-K classes will be added to District 9, which includes Grand Concourse, Highbridge and Morrisania in the Bronx, and District 31 on Staten Island. Classes in District 19 in East New York and District 29 — Cambria Heights, Hollis, Laurelton, Queens Village, Springfield Gardens and St. Albans — will launch in 2020-20121. De Blasio and Schools Chancellor Carmen Farina acknowledged the challenges in launching a 3-K program, which will cost $180 million a year. They will need state and federal money in the future in order to expand it. "This one is in some ways even harder than what we did with pre-K, and is certainly in many ways even higher impact, because it's never been done," de Blasio said. "Here, there's never been kids at the 3-year-old level in New York City public schools. This is a whole new world that we are entering."